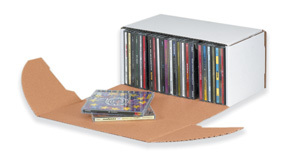 Outside Tuck Corrugated Mailers fold together quickly and easily without the need for tape, glue or staples. They are super strong and yet light-weight to save on postage, and with their unique design, do not interfere with the mailer's contents. Outside tuck mailers allow you to fill the contents of the box as full as you can while also closing the box securely and adding an extra layer or protection. The lid of the box folds down, and the flaps tuck into the edges of the box on the outside. You don’t have to worry about trying to cram the flap into the edge of a fully packed box. You can fill the inside to the brim with books, CDs, DVDs, and other items that take up every last inch of space. The fold over design of the box also results in double wall protection on three sides. The boxes are easy to put together, making packaging operations more efficient. The boxes are also shipped flat when sold, so you can better manage your inventory and reduce storage space in your shipping warehouse, not to mention, they are sold by the bundle to help you save!